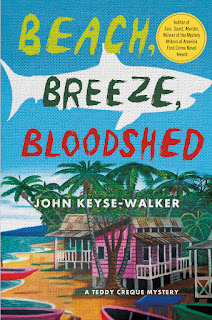 Featured at My Book, The Movie: Beach, Breeze, Bloodshed by John Keyse-Walker. Beach, Breeze, Bloodshed is the second book in the Teddy Creque mystery series. Like the first, it takes place in the British Virgin Islands, specifically on the islands of Anegada and Virgin Gorda. And, as with Sun, Sand, Murder, the location is almost a character in and of itself, so when I think of the books being turned into movies, the principle requirement in my mind is that the film be shot on location in those islands. Who knows, it might be easier to cast the film with quality actors when they know they will be working in a tropical paradise. Denzel Washington would play main character Teddy Creque, a now older-but-wiser part-time cop, part-time fishing guide. He is the person I think of when I write the character. My Book, The Movie: Sun, Sand, Murder. My Book, The Movie: Beach, Breeze, Bloodshed.